This first edition contains a chronology, colour plates and exhibition history for one of New Zealand's most interesting 20th century artists. 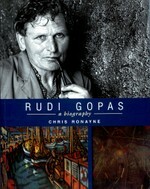 Born in 1913, Rudi Gopas arrived in New Zealand in June 1949 bound for the Pahiatua Camp for refugees. He then went on to become a formidable influence on many late 20th century artists including Philip Clairmont and Phillipa Blair amongst others. At Canterbury University he taught alongside Bill Sutton, Doris Lusk and Don Peebles, all now respected for their own contributions to New Zealand art. This publication includes an extensive list of known works and interesting text provided by Chris Ronayne, the artist's son-in-law, and this gives the book a personal insight to an enigmatic personality.